As I took a break from working on a mean new reverting binary option algorithm my R&D team has the misfortune of backtesting for me for the 30th time :), I came across this story which tickled my interest. It details the attempts of former Israeli political, Knesset member and McKinsey consultant Einat Wilf, to shut down the Binary Options industry in Israel by inflicting a ban. Turns out she was shunned by lobbyists and regulators. And, might I humbly add, rightfully so! Don’t get me wrong; far from being a proponent of scam in the sector, I actually despise what parts of the industry have become and Wilf was indeed on to something back in 2012. But things have changed since then — and for the better, but mainly outside Israel. This need not be the case. One simply has to be granular about the subject and not risk throwing the baby out with the bathwater. Borrowing an analogy from the medical sector; if a patient has cancerous growths, you remove them with surgical precision or, at worst, you blitz them with chemotherapy sessions. You don’t kill the person. Israel banning Binary Options without exploring a hardline regulatory route first would not make any strategic sense, given the country’s influence and smarts in the tech sector both home and abroad. The sector has come to generate over $3bn in turnover globally and, in Israel alone, it employs thousands of people in the Ramat Gan and Tel Aviv area. Israel has been and remains a hotbed for technological innovation, not only in the fin-tech sector but other corollary sectors. In the binary options sector specifically, while it did not invent binary options as an asset class per say (the credit for which may go to a French gentleman in 2002, by the name of Jean-Yves Thereau of Betonmarkets, now Binary.com), major binary option technology platforms, like Israel based Spot Option, made it possible for the retail sector to enjoy the asset class across the world. Alas the growth came too quick. Compared to other asset classes, binary options are mathematically structured to offer the highest percentage payouts relative to capital per trade. Therefore, they also attract the thrill seekers and gamblers. Rather fittingly, those running binary option brands tend to be from the gaming and gambling sector. Hence, the level of sophistication on both sides of the table, is rudimentary with neither really understanding the trading of a binary option; which in its very essence is a financial derivative, just like an equity, fixed income instrument, index, or, most popularly, a currency. This results in less than 5% of binary option traders actually making money. Unregulated brokers meet the demand for thrill and quick profits, by offering promises of ridiculous gains creating a match “made in hell,” with both parties ending up suffering on the wrong end of the stick. Why is that you ask? Yes the depositor’s account is ravaged and depleted but this also has the counter effect of generating many negative reviews online resulting in severe brand damage to the broker as well. Eventually the broker’s brand is left so tarnished that they are forced to close shop and rebrand under a new name, which does not last long. Both parties lose out and this does not have to be the case! By now the ‘pump and dump’ business model of certain unethical binary option brokerages is so well known and widely documented, that I won’t waste your time regurgitating its mechanics in full. In short, the affiliate of a binary broker entices the trader to deposit and thereby gain access to a “money making machine” auto trader that promises to make them hundreds to thousands of dollars per day, for life. The broker in return, pays the affiliate a huge commission (often $250-400 one off or a revenue share based on client losses). The aforementioned auto trader depletes the trader’s account in a week, at which point a seedy, unqualified account manager takes near or full control of the account and coerces large amounts of new deposits, which he or she then ends up trading to zero. This generates pure profits for the broker and leaves the trader disillusioned and financially damaged. The lifetime value of the average client is less than three months, sometimes just a few weeks, owing to this myopic approach. The client does not even have the time to get to understand the financial markets on which binary options are structured and therefore has no time to employ his or her skills to attempt to navigate them over a longer-term period. Binary option brokerages following the new model, instead, engage in client education and focus on technology, providing state of the art trading platforms. This approach results in a higher rate of retention and lifetime value per depositor. Most importantly, it gives the depositor the chance to learn the markets and gain increased confidence to part with larger amounts of capital and allocate this to their own trading of their own account at the broker. This is the new model and it will eclipse the old one because it makes sense, for both depositor and broker. In fact, there are a handful of binary brokerages using the Spot Option platform that are regulated, properly, by the Cyprus Securities and Exchange Commission (CySEC) and offer extremely safe trading environments. An example is Optiontrade. Another broker, ETX Binary, not headquartered in Israel but London, uses the Israeli binary platform provider Marketspulse. It is a misconception that everything coming out of Israel on the binary front is a scam; quite the contrary. The only reason brokerages following the new model are not well-known is that they refrain from participating in affiliate funnels filled to the brim with scam products, that are aimed at fleecing the masses by forcing them to deposit at desperate, undercapitalised binary brokerages. I will go on to say, however, there are also a handful of brokerages that use their indigenous platforms and are regulated in strict regimes like the Malta Financial Services Authority (EU). One such brokerage is Binary.com, the oldest binary broker, that in my opinion is leading the technological revolution in Binary options by moving to an API based platform, allowing for technological transparency and integration. I’m a tech geek, so I look at those that focus on financial innovation or education in the binary options space and not on new techniques for depleting the depositor. There is a major bifurcation in the sector, a “forked road” if I may say and it is important that Israeli regulators close the retail gates to one path but do not lose sight of the other path that is fast evolving. Israel should be at the forefront of innovation and regulation in the sector. Let’s discuss the math because in the math it becomes apparent how beautiful an asset class binary options are and how they offer an entry point for the novice retail trader, a bridge from not knowing how to trade to full-blown professional trading in FX, equities or other asset classes. Let me start by saying, binary options trading is a science that requires technical trading knowledge and emotion control; both of which can be learned and improved over time. It is not gambling, because the odds of winning a trade are a function of your ability, not luck or Murphy’s law (aka your account manager). This is fact and anything else anybody says about this just shows they are not financially literate. A classic option which gives the investor the right but not the obligation to purchase the underlying asset at a fixed strike price is priced using the Black Scholes formula. The global options industry is turning over billions every day and is used for transactional, hedging and speculative purposes. The binary option is a simplified, retail variant of the classic option. In pricing the payouts, it enables the investor to participate in high payouts (ranging from 70-108% depending on binary broker and platform), with a fixed upfront investment, thereby limiting their total potential downside at the outset (which is unique). Certain binary option platforms actually use the Black Scholes pricing model for pricing the payout if a trader wishes to close their position before expiry and some even price payouts on a variable basis, depending on the extent of a price move. This is all science. Knowing whether to buy or sell can seem like gambling because market prices can seem as if they are meandering up and down without any real reason. However the validity of random walk theory is highly debatable and research from Lo & MacKinlay (MIT Sloan School of Management) shows that it may be wrong indeed. Market movements are logical and occur owing to new information (news), transactions and speculative behavior. If this were not the case, then the entire hedge fund and investing industry would be a gamble, which it is not. It is indeed regulated and can be a significant source of long term income for any committed trader. Binary options are no different. Gamblers will read the above as another roulette wheel opportunity, but those who embark on the intellectual journey of education, starting first with where to safely deposit and then spending a few months learning technical analysis, stand a chance at growing their capital substantially over time. It is this, that the ISA and Israeli regulators should focus on; promoting the good and exercising their authority to cripple those that are trying to distort the face of the binary option asset class and in certain instances, FX. On this point, I would like to briefly segue into FX. There seems to be some serious confusion between FX and Binary Options; the two couldn’t be more distinct asset classes, yet it seems sensationalism has gotten the better of journalism nowadays and since some binary option brokerages also double up as FX brokerages, the line is blurred unfortunately. Simply put, FX is a deeply evolved and well regulated asset class. Global FX retail trader volumes are in the $350 billion range per day and when including institutional players that engage in trading of swaps, forwards and derivatives, the daily FX market dwarfs any asset class, generating close to $4.5 trillion in turnover. Brokerages regulated by the US Commodities Futures Trading Commision and the UK’s Financial Conduct Authority, such as Oanda and many others across the globe, have transformed the sector for the retail masses and owing to proper regulation in major economies, market makers like Deutsche Bank provide liquidity to regulated brokerages, where applicable. The conflict of interest, therefore, is effectively zero. Yes there are scam FX brokerages but really they will only attract those who are not computer literate enough to spend a few minutes Googling which FX brokerages are well known. But the amount of FX brokerages that follow the old model are a dying breed and a relic of the past; a time in the late 90s and early 2000s when retail depositors had little protection and FX too was a wild west. The only thing that FX and binary options have in common is that some binary options are priced on underlying currency pairs like EUR/USD or GBP/JPY. In FX there is no concept of expiry, instead take profit and stop loss levels. In Binary Options, the payout is fixed upon expiry, however in FX it is variable and can be crystallised by the trader upon command. So, I beg, some granularity please. Here is a small factoid from our R&D labs; Did you know that when you lose a binary trade, small amounts of cortisol (a steroid hormone) are released in your brain that dull the capability of your neocortex, which governs rational trading decisions and money management, thereby increasing your emotional trading? If you experience consecutive losses, your amygdala, which governs basic emotions such as anger and revenge, takes over. This is known as an amygdala hijack! This is why you blow your account. I will leave you with that and get back to engineering. Oto Suvari is director of R&D, working on algorithm development, at Blue Sky Binary. Oto Suvari is director of R&D at Blue Sky Binary. 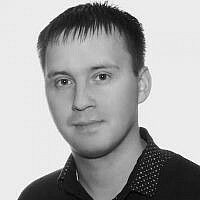 He is based in Estonia and works on algorithm development.